Over the past couple of months I've been working on designing a series of Butterfly Cross Stitch Charts. The current plan is to release one butterfly a month (at the very least) for the next year. I will be sharing the designs here alongside my normal stitching and crafting activities. 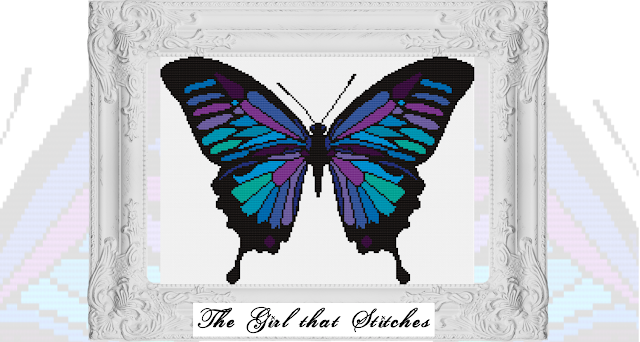 The charts will be available as pdf downloads from my store "The Girl that Stitches." Another Diamond Painting DayLaura (my sister), Colette (my mum) and I caught up last week and got stuck into our diamond painting projects. Mum recently finished her diamond painting. She changed the chart slightly by taking out some of the butterflies, as she felt there was too many. I also charted a bird for her, as she wanted to add a bird in there! I think it turned out well as it ended up blending in nicely with the surrounding chart. My Dad is going to make a frame for the finished piece. I'll post pictures once it's framed!